When Oral-B wanted to sell more toothbrushes to kids, they hired IDEO, a design firm that uses human-centered problem-solving. The Oral-B execs probably wanted more “fun” designs, colors, or partnerships with Disney in order to make their toothbrushes more appealing to kids. IDEO insisted they begin by researching how kids brush their teeth at home under normal circumstances. When they did, they found that kids hold toothbrushes differently than adults. Adults use their fingertips, and kids use a fist. Instead of creating “fun” patterns, IDEO created a toothbrush that was easier for kids’ small hands to hold, winning market share for Oral-B. And by stripping a market problem back to the challenges faced on a human level by the end-users, IDEO uncovered a problem worth solving. What are the benefits to Sales Organizations? Successful salespeople can put themselves in the shoes of their potential customers. To some, it doesn’t come as naturally. Thinking with and training a human-centric approach can be helpful. 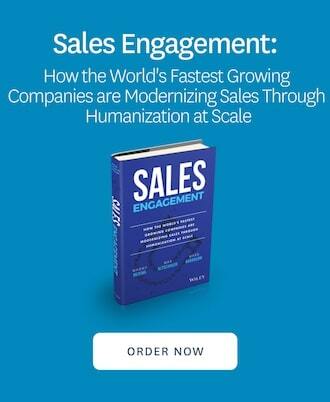 It prompts salespeople to spend more time on human-centric discovery activities in the sales process. Often, this leads to new discoveries and re-frames the initial problems. This approach also helps connect more dots to uncover hidden opportunities. Competitive sales situations include more moving parts. So do situations when the prospect/customer is undertaking a major business transformation. When the deal is complex, human-centric problem solving can help identify unique solutions that will give you a competitive advantage. People like it when you consider their personal challenges first. It makes them feel heard, not pushed towards a sale. Taking a more human-centric sales approach helps salespeople build a shared experience that develops trust, strengthens relationships, and delivers real value for prospects. All of that can lead to longer relationships and bigger deal-sizes. By applying simple techniques borrowed from customer research methods, you will have a much better idea what your customers want (or at least what they think they want). Starting there, instead of with what you already want to offer, can lead to deeper conversations. You’ll also see the challenge more clearly from your customers’ perspective. Once you get their view, using empathy to make sure your solution fits their need becomes worlds easier. For example, you could arrange interviews with customers. Ask them questions about what they think about your product or service, and other challenges they have in their role. Even if it seems unrelated, it’s worth the conversation to better understand what it’s like to be them each day. Another helpful exercise is to shadow your customers while they use your product or service. You can ask them questions here too, or just practice being quiet and observing them as a fly-on-the-wall. Just remember to give them a really nice thank you if they help you in this way! Visit your customers’ websites or places of business, and those of their competitors. Just read and take notes to compare positions later. Study them like you study your own competitors. Pretend to be a customer of YOUR customer, and spend some time in that mindset. Shop their solution like you want to buy it yourself. If you can do it without being intrusive, casually ask your customers’ customers questions about their experience. The perspectives you gain will help you better connect your pitch to the needs of your customers AND your customers’ customers. Doing so will make you look more authentic and caring because you actually will be more authentic and caring. Most sales reps aren’t paying attention with this level of detail. This is where you begin to build trust. Let’s take #2 to the next level. Collect and connect the dots from your team’s interview observations to extract some interesting research angles. Imagine how credible and impressive your next customer meeting will be when you present fresh insights, unique recommendations, and a more targeted and relevant conversation. Imagine you’re the salesperson trying to unseat the existing garbage hauler for Tyson Foods chicken processing plants and you were the first person to suggest that instead of paying to haul away leftover chicken feet as garbage that Tyson could export to them to China. Do you think that might help you build trust? Uncovering new insights can help you turn a sales conversation into a trusted partner conversation. Validate their own understanding of their need using the research findings from your early immersion with their customers. This is a wonderful opportunity to highlight how well you understand the breadth of your customer’s problem. Give them insights and recommendations highlighting why they may be solving the wrong problem. Maybe a different solution direction will solve their problem better than product X. This is a fantastic opportunity to educate your customer and show the additional value your team brings to a deal. This expands #4. Shift the entire conversation away from a solutions discussion to a dialogue about how to improve the future situation of your customers’ customers. This may uncover a broader solution opportunity that goes beyond product X and better establishes your team as a trusted partner to help realize a shared vision that starts with product X but then expands over time to incorporate additional solutions (expanding the sale). Human-centric problem-solving can help you position your commodity solution as a real competitive differentiator for your customer. Product X may be great, but if all their competitors are already using it the same way, none of them are more innovative than the others. There’s no competitive separation. Involve your customer to build a human-technology bridge and create unique opportunities, where the focus is on how product X is used to solve problems on a human level. Think of the product as a building block towards a delivery mechanism of real innovation. You and your competition all sell product X. Competing on price or the quality of your pitch is a risky sales strategy. Your competitors are all playing the same game! Instead, focus on the human dimensions of authenticity and trust you can build by infusing principles of human-centric problem-solving into your sales process and offer. This will be the red relationship ribbon to make you stand out and help you win the deal. Human-centric problem-solving seeks to understand people and their problems to create a “better future” situation. Great salespeople already do it, and don’t even know it! It creates stronger and long-lasting customer relationships and make you a trustworthy partner, but only if you stay curious and look beyond the one-time sale of product X. For maximum success, salespeople must always focus on engendering trust and not just demonstrating how your product/solution will make the customer’s life better. Sometimes you’ll lose a deal with this approach, but the long-term benefits are massive. Look beyond technology, peer beyond today’s needs into the future and the business problems your customer is seeking to understand and overcome for their customers. Boosting your empathy by connecting with your customers’ customers will help you uncover new insights and break out of risky RFP processes. Soon, you’ll be positioned to help your customer innovate or transform, while also helping to demonstrate authenticity, build trust and break out of price/feature competition. So, don’t just walk in your customers’ shoes, help them find new ways to make those shoes run! Braden Kelley is a Director of Innovation Services and Human-Centric Problem Solving at Oracle. Braden specializes in innovation, organizational change and design thinking. He is the author of the best-selling books Charting Change and Stoking Your Innovation Bonfire, a popular keynote speaker and workshop facilitator, and the creator of Change Planning Toolkit™. Adam Radziszewski is a Director of Innovation Services and Human-Centric Problem Solving at Oracle. Adam is an innovation practitioner with extensive experience in enterprise innovation practice building and fostering creative and collaborative organizational cultures. He is a workshop facilitator, Design Thinking and Creativity coach, a practitioner of Behavioral Economics and Experimental Design, and a product development lead.